Open 4×4 safari in another “Big 5” Private Game Reserve selected by Mopaya, where we are very likely to observe Rhinoceros and Cheetahs increasingly rare in their natural environment Monday and Thursday morning. 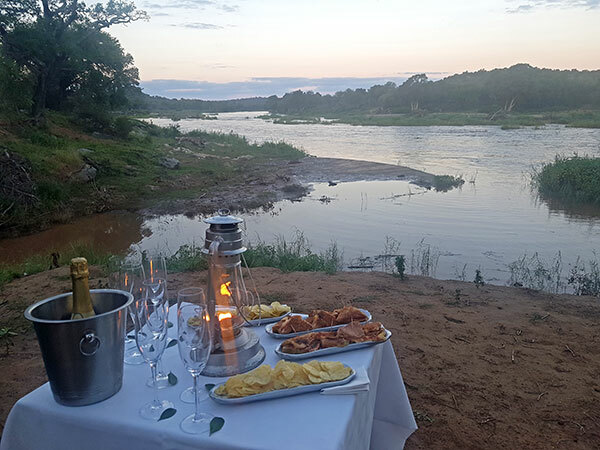 Private boat Safari on the Olifants River in Kruger National Park with lunch on board during the cruise Sunday morning. Dinner in the bush in the middle of the “BIG 5” for a traditional South African braï, weather depending, Sunday night. Bush Walk with footprints and medicinal plants as an open 4X4 Safari on the protected private wildlife sanctuary of MOPAYA BUSH CAMP with a sundowner on the lookout offering a panoramic view of the original ecosystem and preserved from the Kruger National Park and the Drakensberg Mountains, 1 hour drive from MOPAYA SAFARI LODGE, Wednesday and Saturday afternoon. 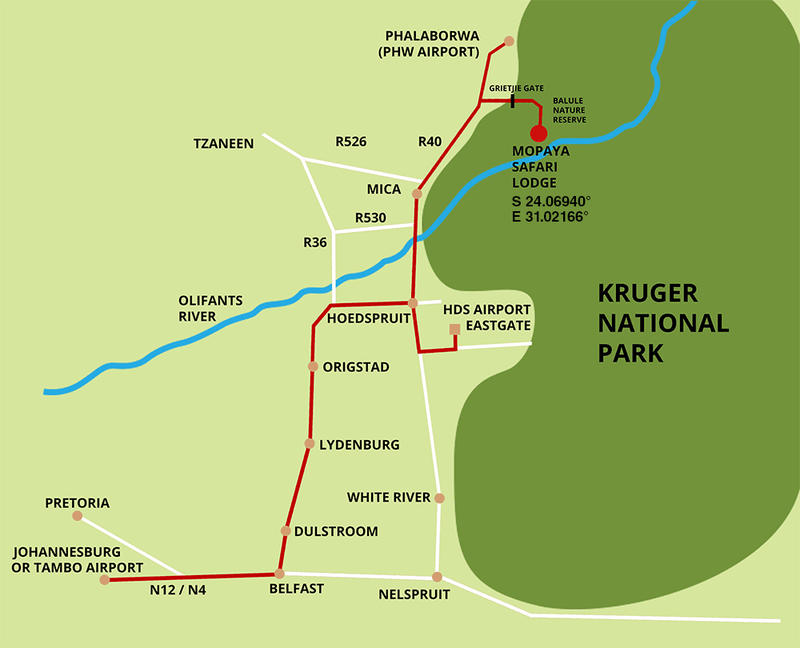 Open Night Drive in the 14.500 Hectares of traversing of the “BIG 5” Private Game Reserve around the Lodge in Kruger National Park and especially when we can locate lions, roarings near the Lodge. To set up with the Guides on site. Presentation on C.R.E.S.A.M. (Conservation and Reproduction of Endangered African Wild Species), a nonprofit company hosted by Mopaya since 2003 and whose aim is to save the last wild cheetahs in their natural environment, with very innovative techniques, by a team of high-level veterinarians. NB:The order of Safaris can be inverted at any time in the interests of the participants and after consultation, especially depending on climatic conditions and opportunities for maximum wildlife visuals can be observed very closely, which makes the specificity of Mopaya, recognized for its flexibility. For info you can read comments of clients on TRIP ADVISOR.